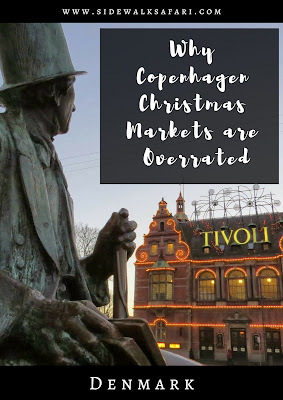 Copenhagen Christmas markets consistently rank highly on various Top 10 lists of Christmas markets in Europe so we decided to try something a bit different and headed to Copenhagen in winter to see how Denmark celebrates the festive season. Sadly, the Copenhagen Christmas markets just didn't live up to the hype for us. 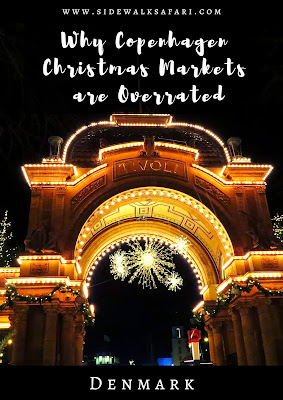 Here are six reasons why I was disappointed by my Copenhagen Christmas market experience. We opted instead for the slightly more economical Tysk Gluhwein (German Glühwein) which was priced at 35 DKK (about $6 per cup at the time of writing). The Upside: Raisins and almond slivers soaked in Schnapps are the secret ingredient that make glögg at the Copenhagen Christmas markets so good (and is probably why it's so expensive)! One of the things that we like the most about European Christmas Markets are the cute souvenir mugs used to serve the glühwein. In Germany, Austria, and Poland, we bought the signature mug at each Christmas market and have developed quite a collection that we use to drink our coffee throughout the year. In Copenhagen, only one of the markets had a mug and it cost 50 DKK (about $9). To compare, in Germany, the mugs typically cost between 2-4 EUR (max $5). All told, our cost for 2 cups of glühwein and one souvenir mug came to 120 DKK or a whopping $22 USD at the time of writing! The Upside: The mugs seem so rare, maybe they will become a collector's item and justify the cost we paid. The Christmas Markets in all the places we've visited before have been free. In contrast, at least a couple markets in the Copenhagen area charged a hefty admission fee. For example, Tivoli Christmas Market costs 95 DKK to enter (about $17 USD). This doesn't even include the cost of ride tickets should you want to give it a go. We visited a smaller Christmas market near Roskilde, a town on the fjord not far from Copenhagen, and paid 25 DKK (about $4.50) for the privilege of walking around a small selection of craft vendors selling high priced wares. The venue itself was located in a warehouse district a good 15-20 minute walk from the train station so we felt we were committed and had to pay the fee by the time we walked all that way over. The Upside: The lights at Tivoli Christmas Market are pretty cool plus they have a laser light show over the lake and reindeer! We always like to do a little shopping when we visit Christmas markets: candles, notebooks, tea, you name it...We are always on the lookout for that little something to send home for the holidays. Alas, in Copenhagen, the crafts offered at the Christmas markets were very expensive. I saw lovely wool hats and scarves for upwards of the equivalent of $100 USD. Needless to say, other than our souvenir mug, we didn't come home with any crafts. The Upside: Everything is expensive in Copenhagen so take heart! The Christmas Markets in Copenhagen (aside from Tivoli Christmas Market) seem to be open rather limited hours. The market near Strøget was locked up tight by 8 pm on a Saturday. The Upside: You'll have plenty of time in the evening to catch a movie at one of the nearby cinemas. Brace yourself to pay the equivalent of $20 a ticket though. You'll also need to make time during the day for the market which offers spectacular views at Nyhavn particularly as the sun is setting. The Upside: As the food options in the Copenhagen Christmas markets themselves were limited, this gave us more motivation to look for delicious alternatives. Our favorite food find in Copenhagen was, hands-down, Flødeboller! We couldn't get enough of these chocolate covered marshmallow treats in a variety of flavors. They were also relatively expensive (between $3-$4 USD each) but they were definitely worth the splurge. Overall, I wish you a Gladelig Jul if you visit Copenhagen in winter. It was interesting to see the contrasts between the Copenhagen Christmas markets and the Christmas markets we've experienced in Germany, Austria, and Poland. While there were some highlights (did I mention the reindeer?! ), I don't agree with the Top 10 rating often bestowed upon the Copenhagen Christmas markets. I wouldn't go so far as to say that the Copenhagen Christmas Markets sucked but in my opinion, your money is better spent in Germany or Austria for a more traditional and affordable Christmas market experience. 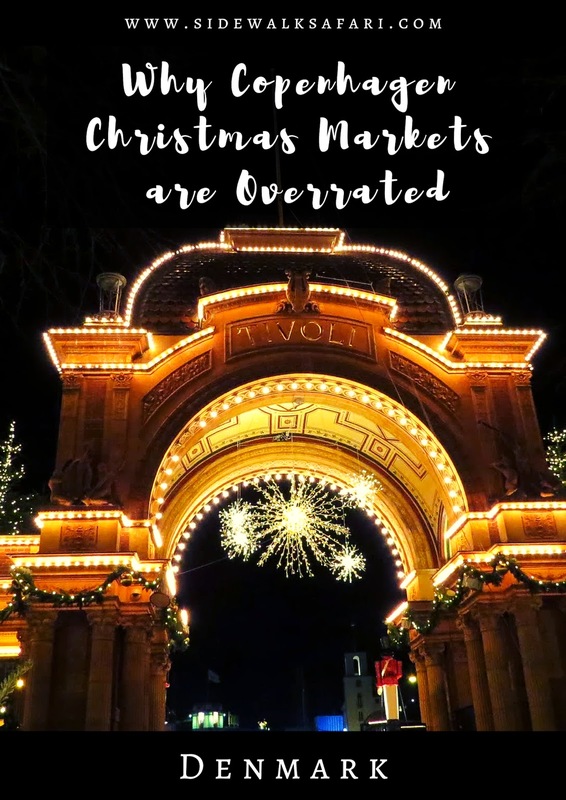 Now that you've read this post, if you are looking for alternatives to the Copenhagen Christmas markets check out our favorite Christmas Markets spanning three countries. Visiting Copenhagen in winter? Read a contrary review about why the Copenhagen Christmas markets are disappointing and why all the Top 10 ratings are unjustified.